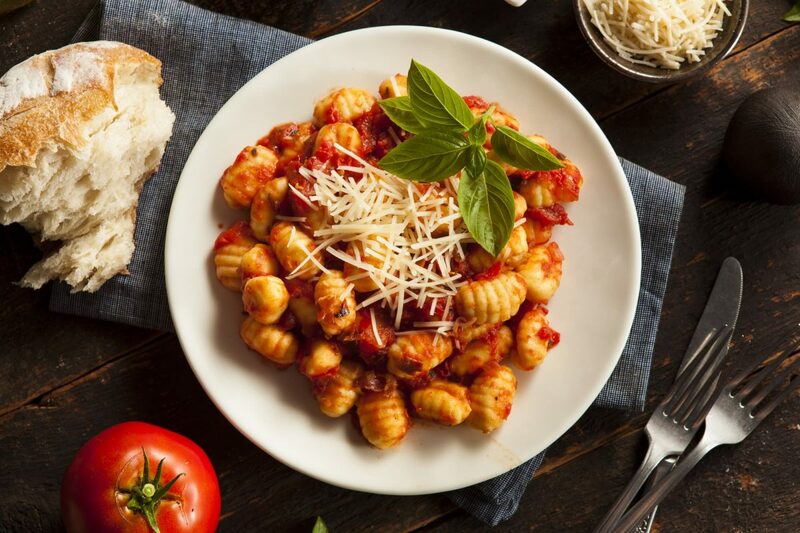 Among the most popular food that people associate with Italian cuisine, and sort of a staple in most Italian restaurants in the United States, are gnocchi [nyoh-ki]. These tiny dough dumplings most typically are made of semolina, parmesan cheese, flour, eggs, salt, and potatoes. But before we proceed right to how to make gnocchi, here’s some factoids about these delectable dumplings you might want to know. So where did these yummy dumplings really come from? 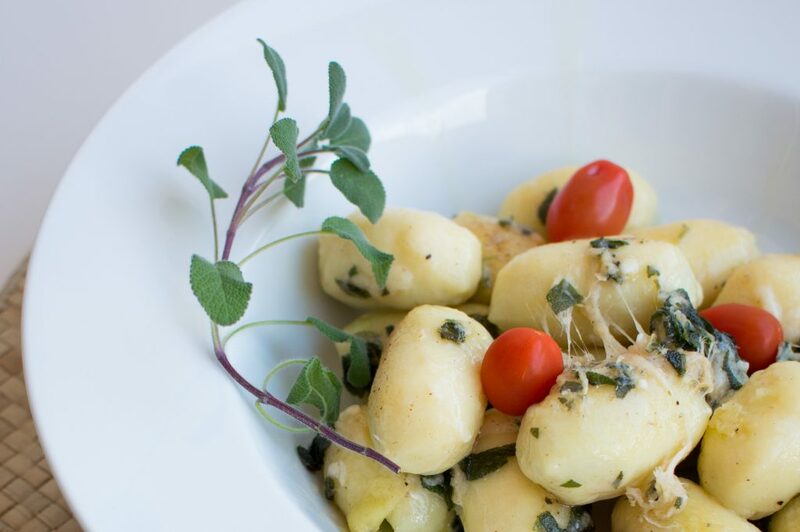 According to historians, the earliest recorded mention of gnocchi was in the 14th century. Mention of them was discovered in Italian cooking manuscripts of that time period. 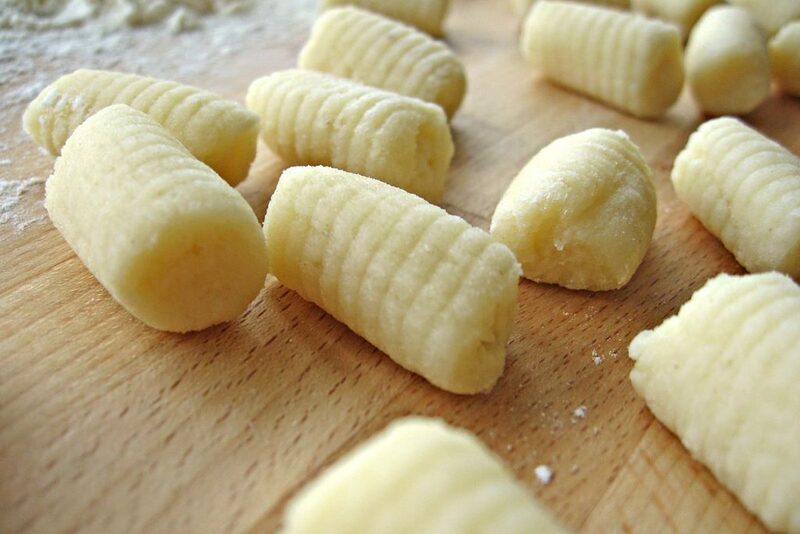 There are many theories as to where gnocchi came from and how they were invented. One theory is that much like the origin stories of many traditional Italian dishes, these dumplings have Middle Eastern origins. The story is that as the Roman Empire expanded their territory, soldiers conquering lands in the Middle East discovered gnocchi, or its earliest predecessor anyway, along the way and liked them so much that they brought the recipe for them back to Italy. On the other hand, some historians also believe that gnocchi have been in existence in northern Italy as far back as the 12th century. Now, the earliest versions of gnocchi, especially those recipes in northern Italy didn’t have potatoes until after Spanish explorers brought potatoes from South America to the European continent. Back then, the main ingredients to making gnocchi depend on the region where it is prepared, or who is preparing it. In some regions it was squash, in others it was breadcrumbs or semolina (durum wheat). 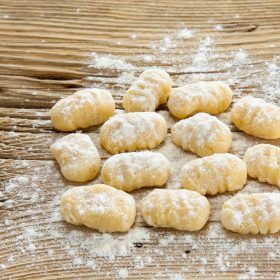 Today, main ingredients when you make gnocchi recipes may be semolina, all-purpose flour, wheat flour, breadcrumbs, and of course, potatoes. In fact, potato gnocchi may be among the most popular gnocchi versions in the world today. Much like cavatelli pasta, there are many stories surrounding the pasta called gnocchi and its name. Where it came from and was it really called that from the beginning? Well, the Italian word gnocchi itself literally means “little knots”. But according to some historians, gnocchi wasn’t really called that before. In writings centuries ago, the term used to refer to these dumplings is maccherone [mah-ke-ro-ne], which is simply a generic name for pasta. In 15th century Lombardy, on the other hand, dumplings that resemble gnocchi was called zanzarelli [zan-zah-re-li]. They were made of bread, ground almonds, and milk. And one of the most famous chef during the Italian renaissance, Bartolomeo Scappi, called it by its name today “gnocchi”, but the main ingredients in his recipe were simply flour, breadcrumbs, and water. Sometime after that, eggs were added to the recipe, but then the dumplings were called malfati [mal-fah-ti], which means badly made. Today, in Tuscany, dumplings made with spinach and ricotta cheese called gnudi [nyo-di] are also called malfatti. Today, the most popular name for these delicious dumplings is gnocchi. Now, where did it come from? Well, one popular theory is that the name comes from the Italian word nocchio [no-kyo], which means knot, or the Corsican word nocca [noh-ka], which means knuckle. Yet another theory is that it comes from the Lombard word knohha [noh-ah], which means wood knot or walnut. But what’s in a name… that which we call gnocchi, by any other name, would still probably taste as scrumptious. Don’t you agree? 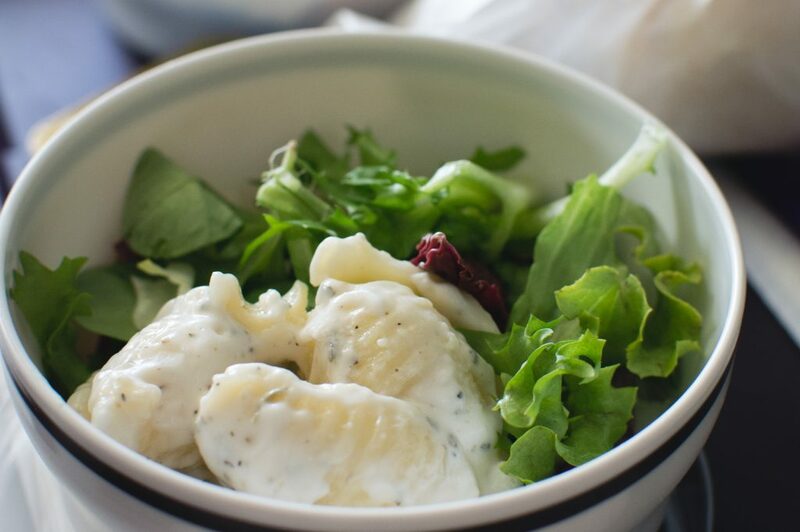 Now that you know all about gnocchi and all the interesting stories behind its invention, let’s now proceed to actually making some of these yummy dumplings. 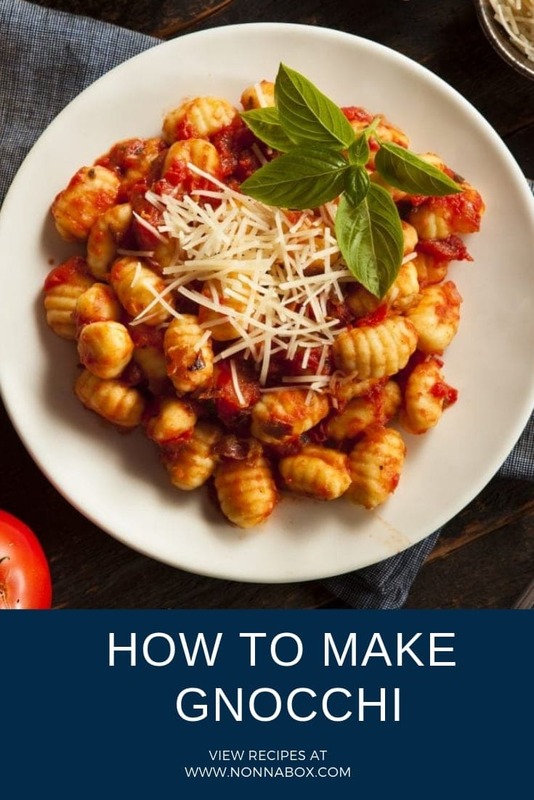 So how do you make gnocchi, eh? Although you can make gnocchi with just flour and eggs, gnocchi is typically made with boiled or baked potatoes. So in this recipe, we will be including potatoes. Wash the potatoes thoroughly. Make sure to remove all dirt. In a large pot, put enough water to cover the potatoes when they are placed inside. Put to a boil. When the water's boiling, put the potatoes carefully. Boil for about 30 to 40 minutes, or until they are soft enough that they can be easily pierced with a fork. Once done, drain the potatoes and peel the skin while they're still warm. If you have a potato ricer, you don't need to peel them. Mash the potatoes. Make sure to get rid of clumps but don't over-mash. Combine the mashed potato and flour. Add the egg and combine with the potato dough. Then, add the salt. Combine and knead the ingredients until you get a soft but firm dough. Be careful not to knead it too much. Once you get the right dough consistency, slice a portion of the dough, perhaps a quarter, and roll that into a rope. Note: Cover the rest of the unused dough to prevent it from drying out. Sprinkle some flour on your hands and the worktable to prevent the dough from sticking. Once you get a medium-sized rope, cut them into 1-inch slices/portions. Now if you have gnocchi board, you may also use those to make ridged doughs. To do that, use your thumb (or forefinger and middle finger together), press and roll each dough piece downward, making ridged curls as you go. If you don't have a gnocchi board, you can also just use a fork to make the ridges. Or you can simply make indentations on the dough with your thumb. The design will add aesthetics to the dumplings and also makes sauces cling much better to them. In a saucepan, put water to a boil and add salt. Drop the gnocchi dumplings into the boiling water and stir, to make sure they don’t stick to each other. Boil them for about 2 minutes, but not more than 3. When the dumplings start to float in the boiling water, that means they’re almost done. Just give them another 25 seconds or so. Remove them with a slotted spoon or carefully drain them in a colander. Add your preferred sauce to it and serve. You can cook gnocchi as soon as you create the dumplings. You can also dry them in a tray for a few hours, if you want, and cook them a few hours later. If you want to keep them for cooking at a later date, put them on a tray and freeze them. Make sure they don’t touch each other so they don’t stick together. Once frozen, you can keep them in food bags and they will keep up to a month or so. The classic way to serve gnocchi is with butter and sage. However, you can use Pomodoro, pesto, meat sauce, or mushroom sauce. You can also fry them, bake them, or put them into soup. In Rome, it is traditional to eat gnocchi on Thursdays. The locals call it Gnocchi Giovedi [nyo-ki-jo-vi-di], which means Gnocchi Thursday. During this day, you will most probably find a gnocchi dish on the “Specials” board of any restaurant within the city and the dish is served throughout the day. In Poland, dumplings that resemble gnocchi without potatoes are called kluski [klos-ki]. How do they make gnocchi in Poland? They also make it with flour, eggs, butter, salt, and water. They also have their own version of potato dumplings, which they call kopytka [ko-pit-ka]. These are the ones that most closely resemble the Italian gnocchi di patate. The only difference is their shape and size since kopytkas are rectangular and have larger dumplings. Like gnocchi, it can be cooked with different kinds of sauces, but it is popularly served with beef stroganoff. 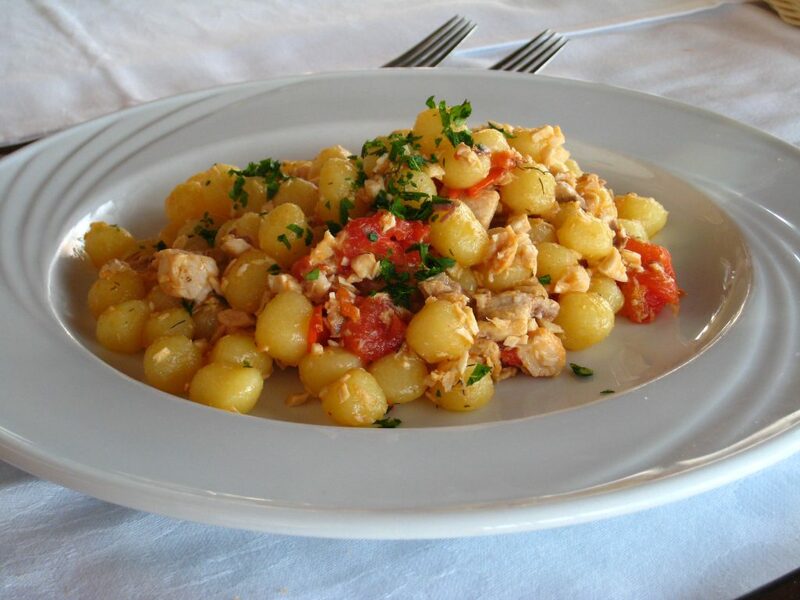 Italian immigrants introduced gnocchi to South American cuisine during the early 20th century, and today it can be found in Brazilian, Venezuelan, Colombian, and Argentinian cuisines. As a matter fact, it is so popular in Argentina that they have declared the 29th of every month as Dia de Ñoquis, or Gnocchi Day. Yes, they make gnocchi and eat them every month! The story behind the celebration is that every 29th of the month is considered a day when money is tight since people were paid their salaries every first day of the month. Since gnocchi doesn’t need many ingredients and potatoes and flour were the last things to disappear from a kitchen larder, then it was the perfect meal to make, cheap but deliciously filling. Another thing Argentinians celebrate on the 29th is the canonization of the Italian saint, San Pantaleone. Argentinians celebrate every Gnocchi Day cooking and eating the yummy dumplings with friends and family. I was reading this recipe and I got hungry so I decided to make one for myself. I never imagine gnocchi can be this good. Craving satisfied!